In an unassuming townhouse on Manhattan's Upper East Side, neighboring the Audubon Society, there one finds the Ramakrishna-Vivekananda Center of New York, where spiritual leader Swami Adiswarananda lovingly tended his flock for 35 years. Tall in stature, and exuding confidence in the ancient Vedic texts he explicated, the Swami was known for his razor-sharp intellect, sparkling sense of humor, and inner generosity. He conducted services and classes thrice-weekly, often taking a few lines from the Gospel of Sri Ramakrishna, and weaving them into a personal discourse filled with practical tips on modern living. He was widely read, and knew what was going on in every field of endeavor, from medicine to computers. Despite his vast knowledge, he remained a humble man who called little attention to himself. A monk of the Ramakrishna Order, he did everything in the name of Sri Ramakrishna, Sri Sarada Devi, and Swami Vivekananda. Under his ministry, services were a harmonious blend of East and West - with organ music Sunday mornings, hymns to Sri Ramakrishna Tuesday evenings, Vedic chanting on special occasions, and Christmas carols. Neighborhood residents who sometimes wandered into services were struck by the austere beauty, the uplifting atmosphere, and the feeling that truth-seekers of any religion were always welcome. One visitor remarked, "He was a spiritual giant and a brilliant speaker. He would make you realize the truths of the Indian sages in your heart, and make you want to live them. But what I will miss most is his sense of humor and kindly manner. He was a beautiful, noble soul." When news of his sudden illness was announced at Tuesday services, many followers wept openly. Later, official word came that after a massive brain hemorrhage on Monday, the Swami passed peacefully into unconsciousness, and died Wednesday, October 31, 2007, 2:20 PM. Swami Adiswarananda was born in 1925 in West Bengal, India. After being fully ordained as a monk in 1963, he served the Ramakrishna Order in various capacities as a teacher of religious subjects, and journal editor of Prabuddha Bharata at the Advaita Ashrama at Mayavati, in the Himalayas. In 1968, he was sent to New York to assist Swami Nikhilananda, the founder of the Ramakrishna-Vivekananda Center of New York. 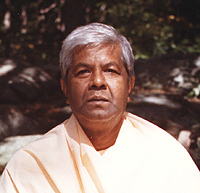 In 1973, Swami Adiswarananda assumed the role of minister and spiritual leader of the Center. An authority on meditation, spiritual practice, Yoga and Vedanta philosophy, he has written and edited several books, including Meditation & Its Practices: A Definitive Guide to the Techniques and Traditions of Meditation in Yoga and Vedanta; The Spiritual Quest and the Way of Yoga: The Goal, the Journey, and the Milestones; Vivekananda, World Teacher: His Teachings on the Spiritual Unity of Humankind. "The Parliament of Religions held in Chicago in 1893 envisioned the harmony of religions and unity of humankind. One hundred years have passed, yet the dream of unity and harmony continues to prove elusive. Religious intolerance and misunderstanding keep the world divided and stand in the way of a harmonious world culture. Wherever we look, we find pain and suffering, disunity and despair. The acts of hatred and violence, committed in the name of God and religion, are disgraces of human history. The need for unity and mutual understanding has never been greater than it is today. We live in a world which is neither Eastern nor Western, where every one of us is heir to all of civilization. The vision of a new world order requires a new world outlook, based upon respect for and understanding of other religious traditions." In his own ministry, Swami Adiswarananda emphasized the need to develop good character, to understand the nature of the mind and the senses, to practice restraint and philosophical discrimination, to work unselfishly, and to fix one's mind on God. He was always an uncompromising truth-seeker, and never an object of idolatry; but his followers loved and revered him, and remember basking in the warmth of his inner light. Funeral services will be held on Friday, November 2, at 12 noon, in the chapel of the Ramakrishna-Vivekananda Center at 17 East 94th Street, to be followed by cremation. All are welcome to attend services in honor of Revered Swami Adiswarananda.